There are some places in town that you just have to see, but you rarely get an opportunity to do so. You know what I'm talking about ... historic mansions behind huge brick walls, the viewing area at the apex of The Pyramid, the upstairs of Graceland. This morning, as I was motoring down Lamar Avenue, I stumbled on just such an opportunity: An estate sale at the historic Snowden home. 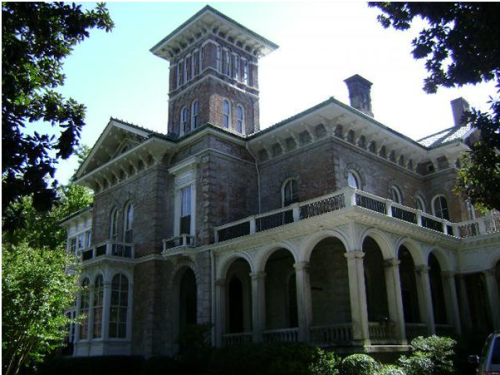 In 1850, Dr. Samuel Mansfield built an Italianate mansion on 200 acres on the outskirts of Memphis. Nineteen years later, Colonel Robert C. Brinkley bought the estate as a wedding gift to his daughter, Annie Overton Brinkley, and her husband, Colonel Bogardus Snowden. At that time, it was dubbed Annesdale, for Annie's Dale. "Architecturally, the house, with its square tower, bracketed cornice, round-arched porch, and asymmetrical plan, was absolutely up-to-date for the mid-1850's. Although the name of its designer is unknown, details of the exterior and elements of the plan quite possibly were derived from a "Norman Villa" designed by the Philadelphia architect Samuel Sloane." The entry fee for the estate sale is $5 and all proceeds benefit the Church Health Center. It's well worth the fee: The home is beautiful and when else are you going to be able to go inside? Most times when you drive by, the gate is closed, and you can't even see the house from the street. I didn't have time to do a lot of exploring but the grounds are amazing — very Secret Garden-y, if you're into that sort of thing. Oh, and the sale continues the rest of the weekend.